BOOKING FOR SUMMER!! HURRY AND RESERVE!! Our newly refurbished lakefront home is located in the beautiful gated community of Bear Paw. Surrounded by the Nantahala National Forest, our home on Lake Hiwassee offers spectacular scenery, amenities, and tranquility. 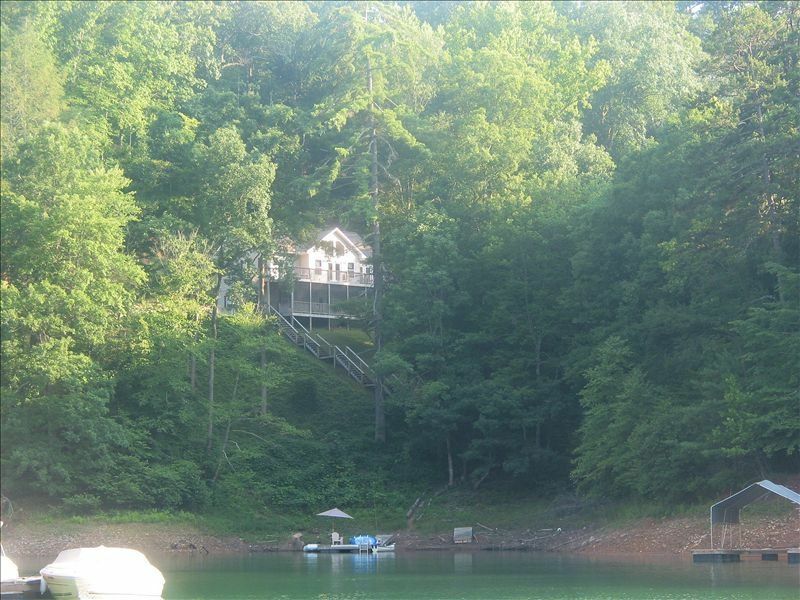 We have named our home 'Paradise on the Lake' because it is just that. A few of the features include a main floor that is predominantly hardwood and tile floors with a hardwood cathedral ceiling. The house has many windows and French doors that overlook the lake and fill the house with light. The main floor has two king master bedrooms, two baths, a dining room, kitchen and a living room with a wood burning fireplace. The lower level has a second living room with a gas fireplace, two bedrooms and a bathroom. Each floor has it's own large deck providing plenty of room for outdoor enjoyment. Take a walk off the lower deck to the lake where you can dock your boat on your private boat dock, or swim, or just relax and enjoy the peaceful scenery. Some of the community amenities in Bear Paw include tennis courts, swimming pool, basketball courts, children's playground and child's fishing pond. The community center offers many activities, and crafts. A secured gated entrance adds to the feeling of peace and tranquility. If boating and fishing are your pleasure, there is also a full service marina located in Bear Paw where the ability to rent a boat is less than five minutes away. Our family was there for a week and everyday was an adventure ! The house had so much room and the lake was fabulous ! Also, the house was super duper clean and all the beds slept heavenly ! This was our second time and we are sure to go back ! Thank you Lisa !